At Laundrapp, we’re confident that we can provide a simple and convenient solution to all your dry cleaning and laundry woes. That’s why we guarantee you’ll be satisfied with your order! It can still be a little daunting to book your first collection, but don’t worry – we’re happy to answer any questions you may have about our award-winning laundry service! What services does Laundrapp provide? Dry cleaning, laundry and ironing services, shoe repairs – Laundrapp offers a wide variety of simple and convenient services to help you look smart and save time. We also offer free collection and delivery on all orders, so you don’t have to worry about drying clothes around your flat or carrying duvets to the local dry cleaner. No matter what you need cleaned, we’re confident we can help! Unlike old-fashioned dry cleaners, Laundrapp is open 7 days a week – and you can order at any time through our website or award-winning mobile app. No matter when you order, our free collection and delivery service means you don’t have to worry about carrying your clothes to a shop. You can even use the app to track the progress of your delivery right to your door! Not at all – our prices are competitive with old-fashioned dry cleaning stores. 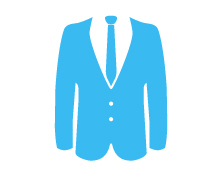 Dry cleaning prices start from £2 per item, with free collection and delivery as standard. We also offer plenty of special offers and discounts on a weekly basis, along with rewards for regular customers. Download the app today order online to check prices in your area! Is Laundrapp available in my area? Laundrapp is available in more than 100 towns and cities across the UK, including London, Birmingham, Bristol, Manchester, Liverpool and more – so it’s more than likely we’re your area already. Find out for sure by downloading the app today or checking your postcode online! Do I need to do anything before collection? Just have your clothes ready! Your Laundrapp Agent will bring a Laundrapp bag to place your loose clothes in, so it helps to have them all together. You don’t need to sort colours, but it helps if you can keep your dry cleaning and laundry separate if you’re ordering a mix of services. Love Laundrapp? Help spread the word by writing a review!